Last week, we introduced the case statement. We noted that it is like a VLOOKUP – it searches through a list to find the value that matches, then it reports back on it. 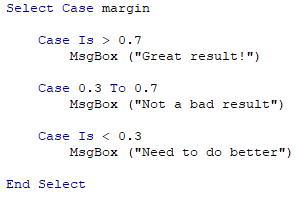 What if you want a numeric value to meet a particular condition? What if none of the statements match? In the case of X To Y, it will search for values that will fall between (and including) the values X and Y. In the case of Is >=X, other comparison operators (e.g. =, <>, <, <=, > and >=) can be used to provide that restriction. 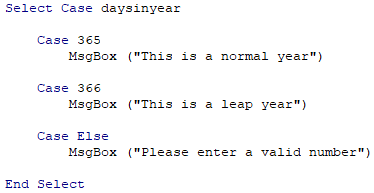 Last week, our leap year example had a single case to check if the value was 0, rather than 365 or 366 days. However, if a value of 200 was entered, it would not provide a correct answer. This is where we need to use Case Else. This means that anything that doesn’t match 365 or 366 will prompt us with a message box telling us that our value is invalid. We have an interesting query from a client coming up, so check back next week for more!